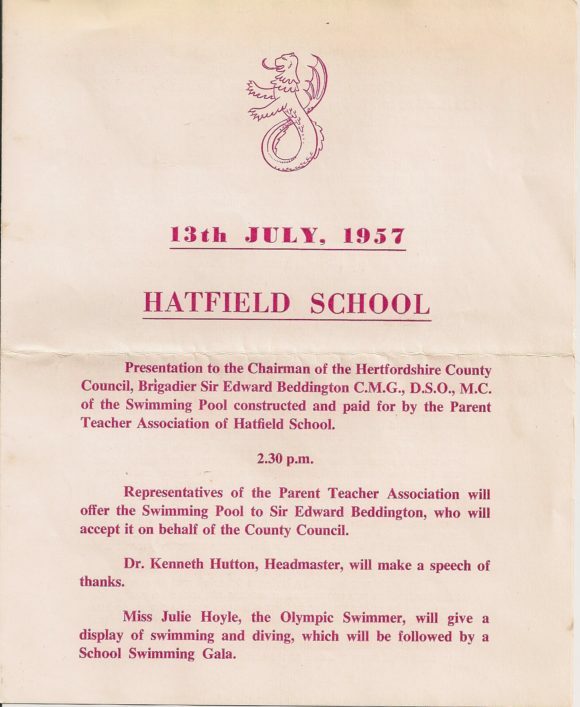 At the end of 1955 an association was formed to build a full size swimming pool for Hatfield School. Fund raising events were held and a large number of families guaranteed weekly sums which were collected from the pupils at school. 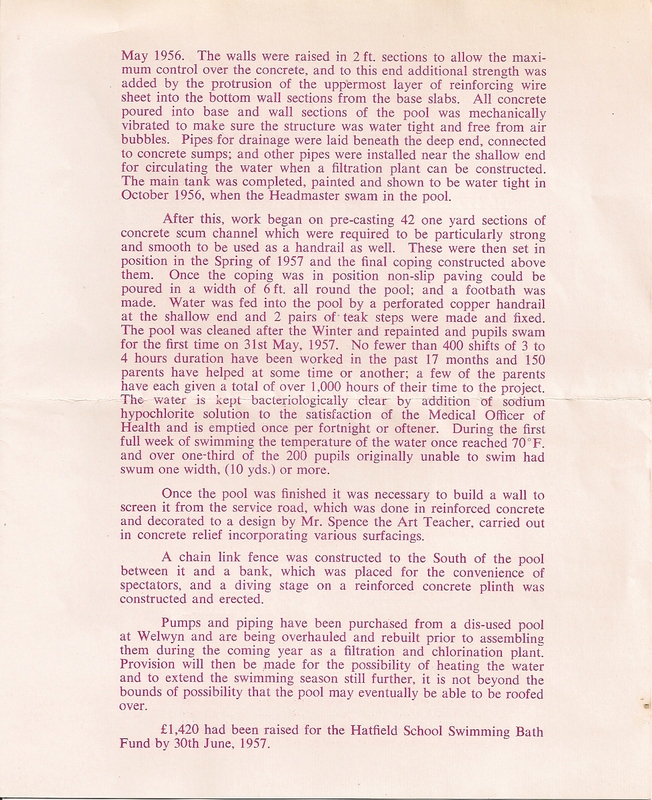 Plans and specifications were drawn up and by January 1956 these were approved by the County Council. 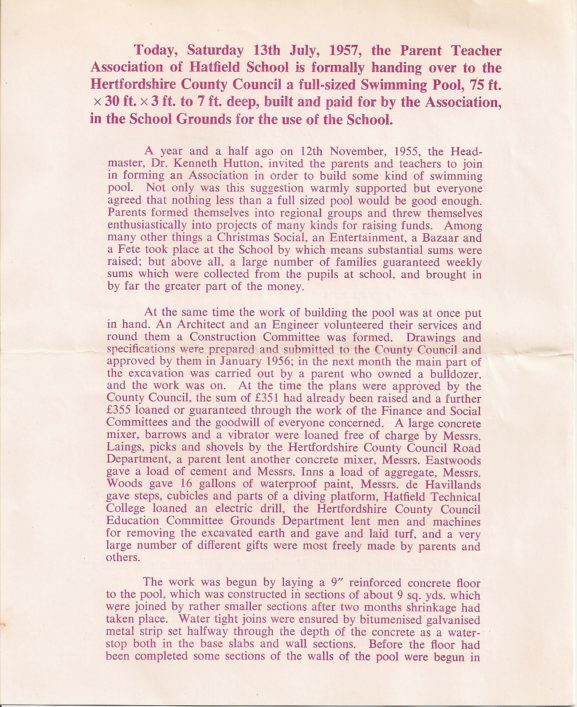 By October 1956 the main tank was completed, painted and shown to be water tight when the Headmaster swam in the pool. 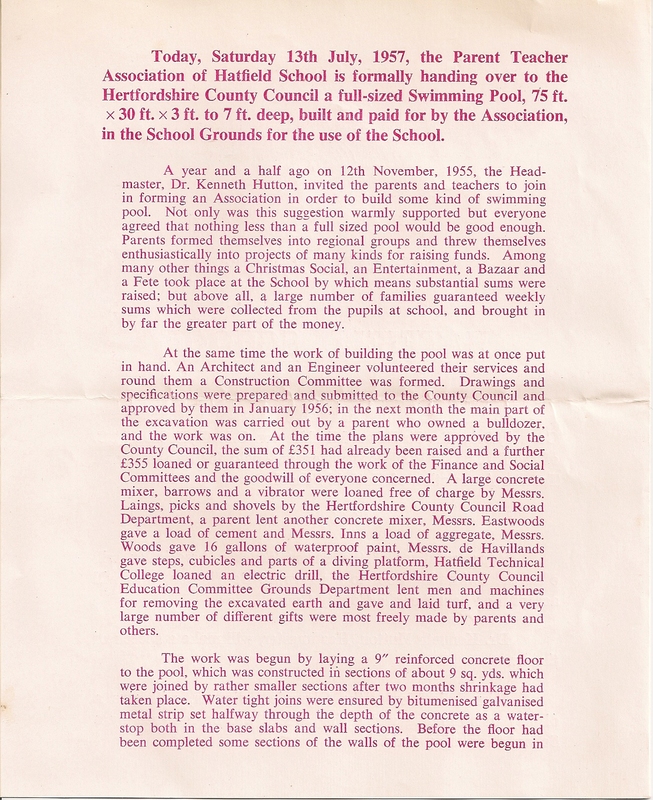 The pupils swam in the pool for the first time on 31 May 1957. By 30 June 1957 the Hatfield School Swimming Bath fund had raised £1,420. The total cost came well within the £2,000 asked for. 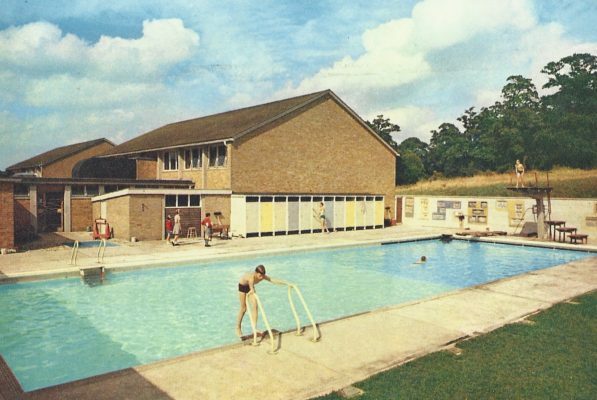 This swimming pool sadly no longer exists and the site of it is now covered by buildings on the University of Hertfordshire’s Campus along College Lane. Does anyone remember the pool being built and have a story to tell? 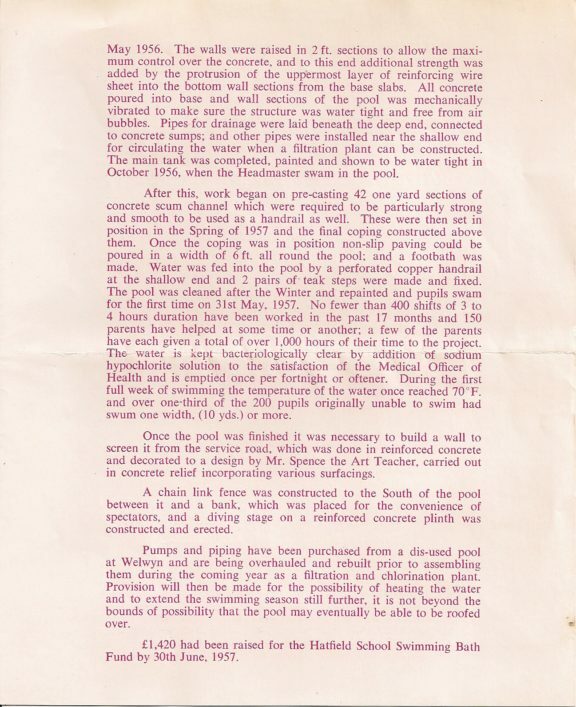 For a more detailed account of the building of the pool see below. This page was added on 16/03/2017. The highlight of the pool opening was the Head, Kenneth Hutton being thrown in fully clothed. All staged of course, but made the tabloids and delighted me as a 2nd year. That’s me climbing out of the pool. I was shown the photo after it was developed. 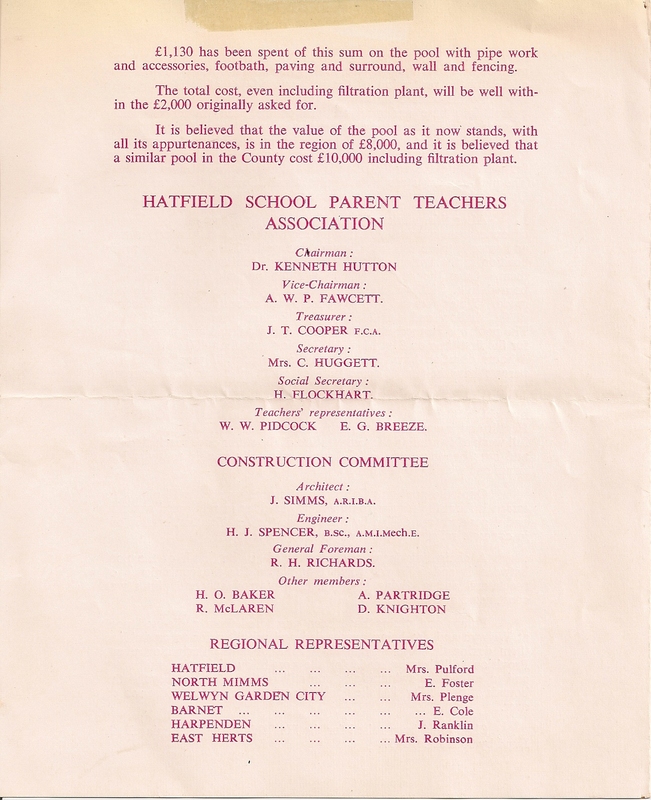 I was at Hatfield School from 1959 to 1966 and my elder brother was there from 1955 to 1962. 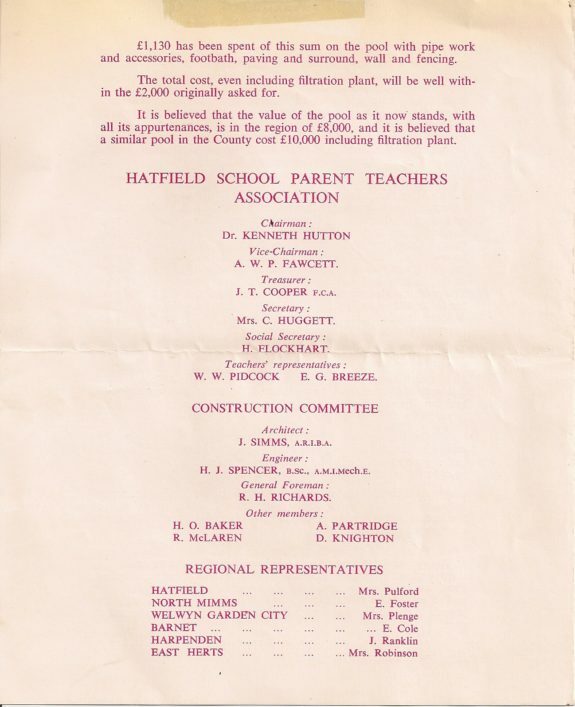 Actually my primary school, now Hazelgrove in South Hatfield, was initially in one corridor of the Hatfield School building. I remember well when the pool was built by parents and teachers. There were casts of mermaids and fish made and we were allowed to swim after doing an hours work. The filtration plant, a large metal cylinder filled with different grades of gravel, came from the Clock Restaurant north of Hatfield on the A1. I helped dig out the gravel as I was small enough to get inside. Sorry that it has now gone.